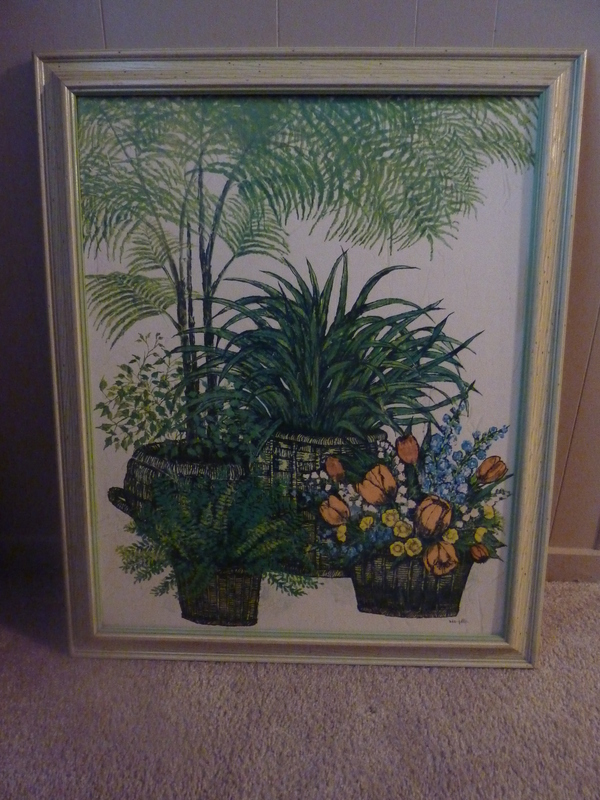 After seeing this lonely (huge) mass-produced piece of 70s artwork week after week (unloved) at the thrift store, I knew I had to do something about it. It was basically calling my name. Ken was appalled, as he frequently is when I come home from the thrift store. Though I’m not quite sure why. The orange tulips have a sort of charm. When I took this huge piece home, I didn’t have a clear idea of what I was going to do with it. That’s usually my cue to not purchase said item from the thrift store in the first place, but this was only $2.50 and I knew that I could eventually do something with it. So I pondered for a bit, all while this thing sat in our hallway, much to Ken’s chagrin. 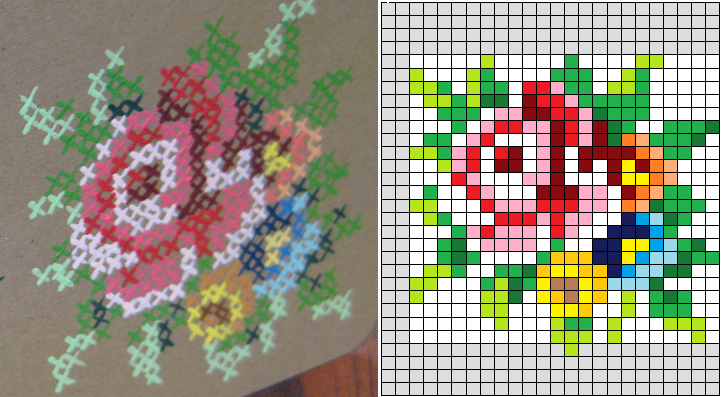 BUT THEN I remembered this pin of a painted cross-stitched rose and everything clicked. Well, mostly. Since Ken is not really into “granny-chic” (nor I, for that matter), I knew I needed to make this less pink and flowery. So I compromised slightly and found this image that I created a pattern for. I made sure that I had easy measurements–each X took up exactly an inch. And I wanted the design centered on the painting, so that’s why I used those gray squares to roughly show where not to paint. I did mentally adjust the design over to the left one space, since you can see that this whole centering thing was difficult for me. And so I painted and painted and painted. 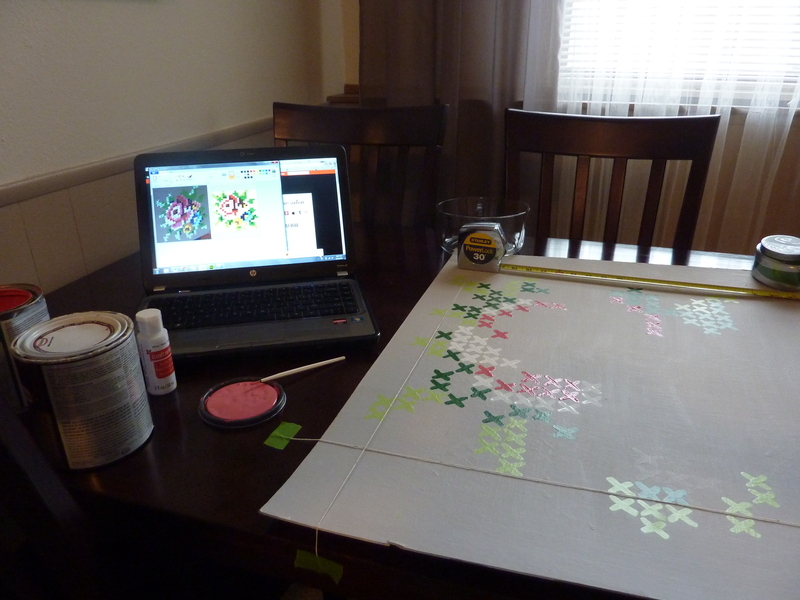 I used whatever paint I had on hand, from flat wall paint to cheap craft store acrylic paint. I used a tape measure to keep myself on target along with some strings to show me where everything was in reference to each other. Once it all dried, I coated it with polycrylic to give it a more polished sheen. I also painted the frame–first with a coat of yellow and then with a bit of gray brushed on to tone it down. 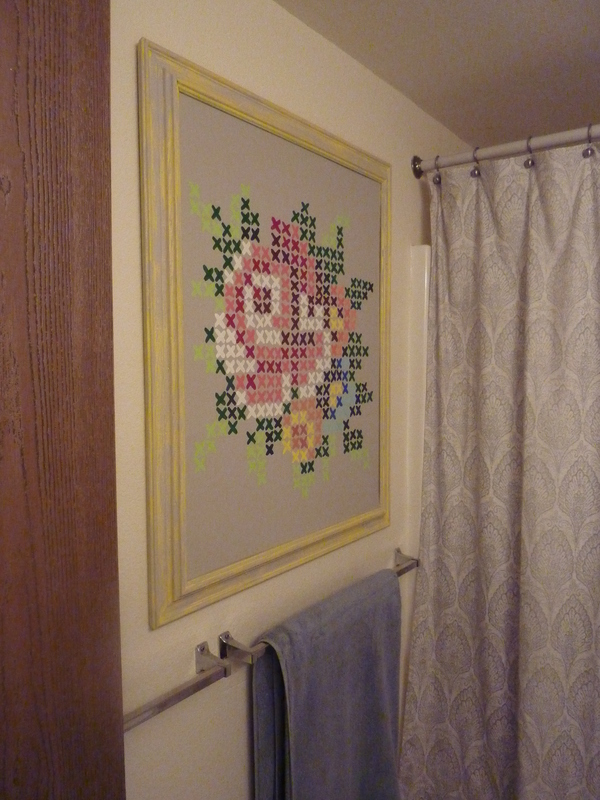 And then I hung it up in our bathroom (the Van Gogh is currently hiding under our bed). It looks pretty cool reflected in the mirror (this is what we see from our hallway). When Kenny and I registered for wedding gifts, I was very concerned with getting everything to match a certain color scheme…but now that we’re actually living life together, I find that we like colors in general. I needn’t have been so worried. Anyone else rescued any pathetic cases from the thrift store lately? I can’t be the only one with a soft spot in my heart for the ugliest things. 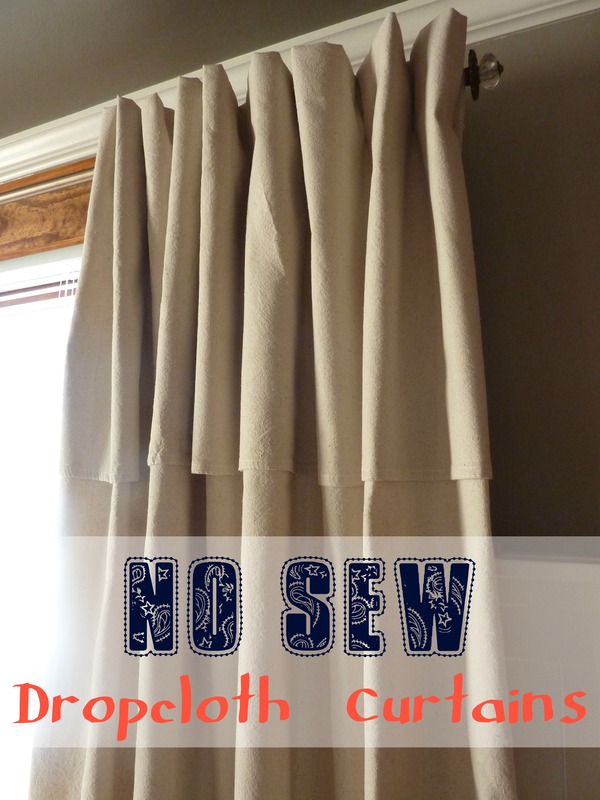 Linking up here and here and here and here and at Thrifty Decor Chick! Categories: DIY, Home Decor | Tags: colorful flowers, cross stitch pattern, cross-stitched painting, thrift store art | Permalink. Wow – this turned out great! 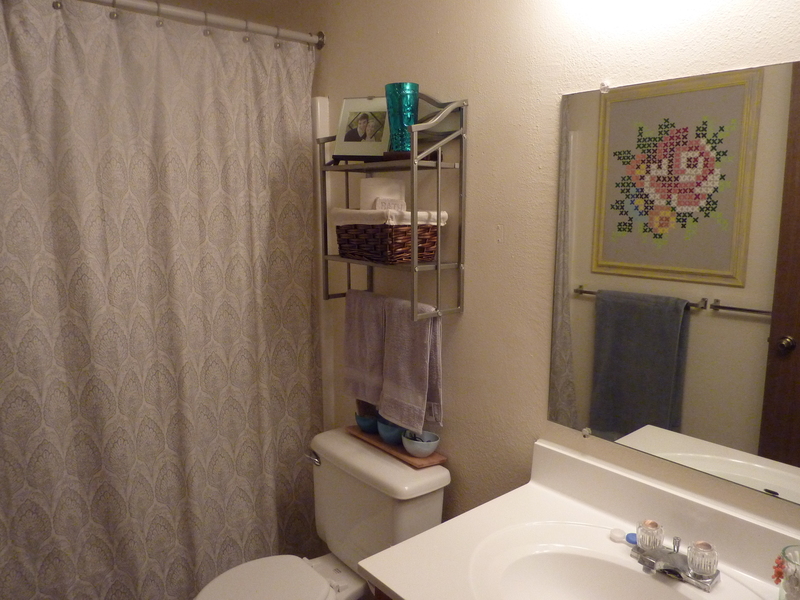 And I don’t think it looks too granny–ish with your other bathroom accessories. I really like it! Not too granny-ish at all! OH GOOD/THANKS!. Also. I love your new house and can’t wait to see what you do with it. That is all. I think this is the modern take on Granny cross-stitch – clever! 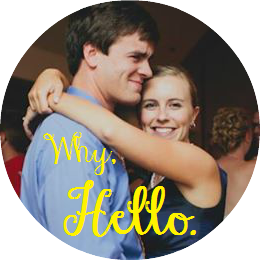 Thanks for linking up to my April Project Party!